(Newser) – An electrician working on what will soon be the tallest building on the West Coast fell 800 feet to his death Thursday afternoon in Los Angeles, landing on a passing car, the AP reports. The tragedy occurred at the under-construction Wilshire Grand hotel at "one of the busiest times of day at one of the busiest intersections in downtown Los Angeles." The unidentified electrician was working on the 53rd floor when he fell, according to the Los Angeles Times. It was only his second day on the job. “It sounded like a bag of cement fell off the edge of the building,” says a Times photographer who was on assignment at the hotel. 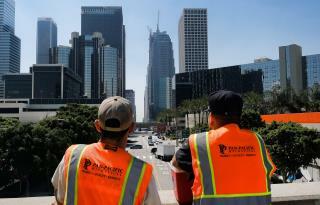 Nearly 900 people were working on the site at the time of the accident, KTLA reports. It is the first injury on the project. They say landing on a car, its roof preferably, can be good but only for a short fall. It will crush down at least a foot or more to give you more stopping distance. From that height it looks like you'd be falling about 110 miles per hour, though. Assuming you could survive, say, 50 Gs for a very short instant (just a wild guess), you'd need padding, or a trampoline, that can flex by at least 20 feet after you hit it. Poor guy. As a newbie prank, someone probably told him to perform a gravity check. It may differ from state to state, but on floors with no windows installed, you have to wear a safety harness if you get within 15' of the ledge. Safety barriers are also installed. What a horrible death.